Juan and Javier start very early each morning. They have a contract to supply a Michelin-rated restaurant with white, deckle edged paper for their menus. When I arrive, the studio is in production mode. 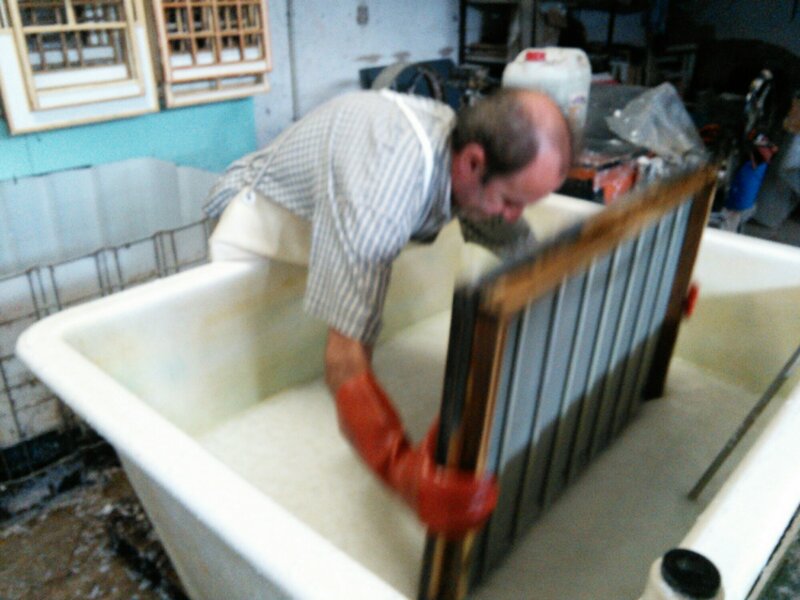 Javier has milled up a big batch of cotton rag pulp and periodically transfers it to a vat from which Juan can top up his main dipping tank as needed. 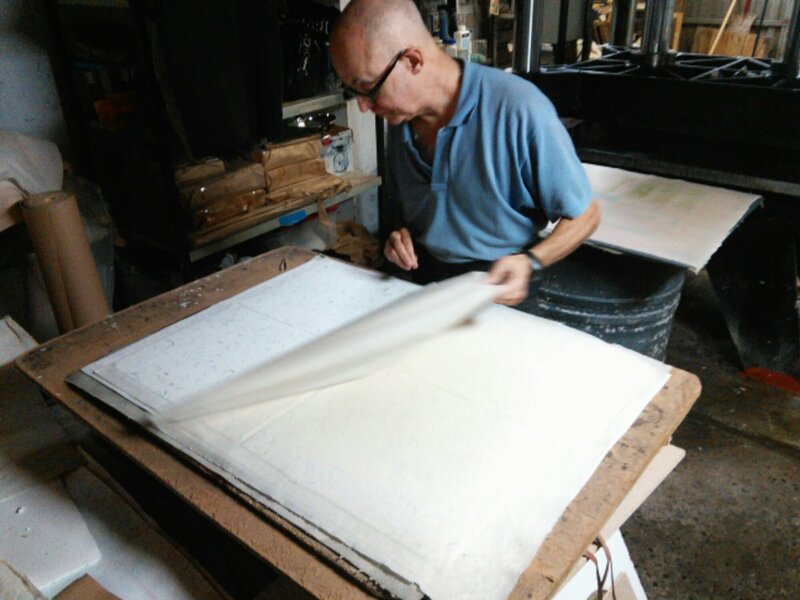 It’s a big order, so Juan is using a large screen and deckle that makes six sheets at once. Once he agitates the pulp to the proper level of suspension with a giant blender stick, he bends over the tank, and deftly, smoothly and quickly dips and pulls up. Then, after letting the excess water drip away, he “couches” the wet sheets onto felts and release material – another very smooth move – then covers with a heavy dampened drying sheet and repeats the process. Again and again, until he has a post of wet sheets between two heavy PVC sheets. 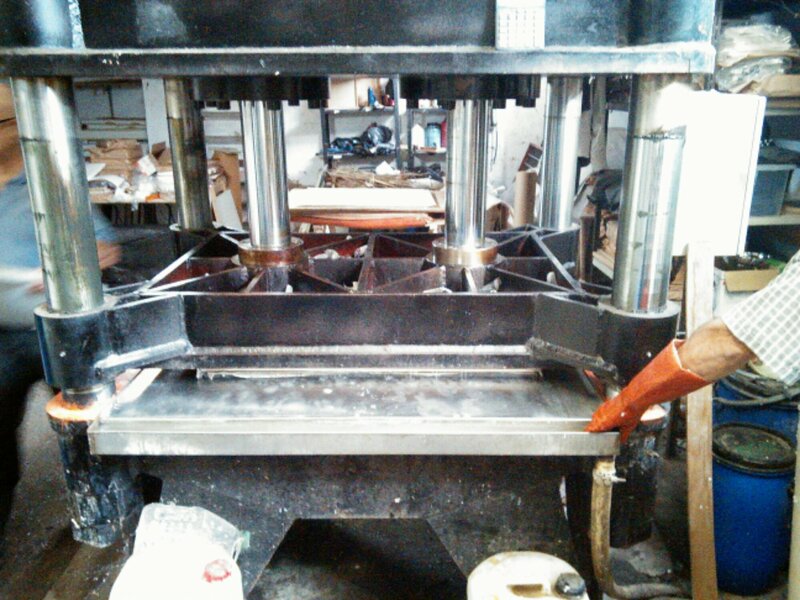 Juan shows me the most ergonomic way to help shuffle them over to his press. He had it custom-built at a machine and metal work shop down the street: super heavy-duty, set for >50 tons pressure. 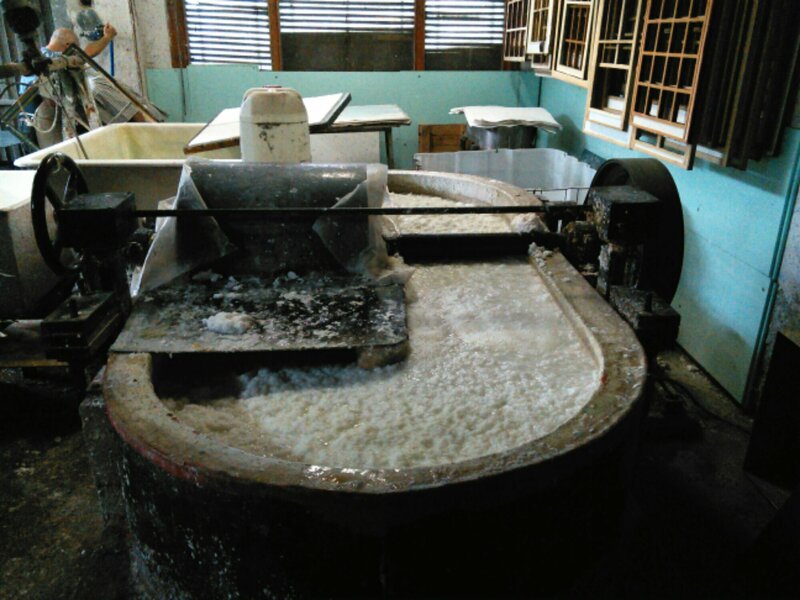 I learn how to operate it: power on, press down…wait for 50T pressure once water starts flowing out of the post of paper, then stop the press and power off. 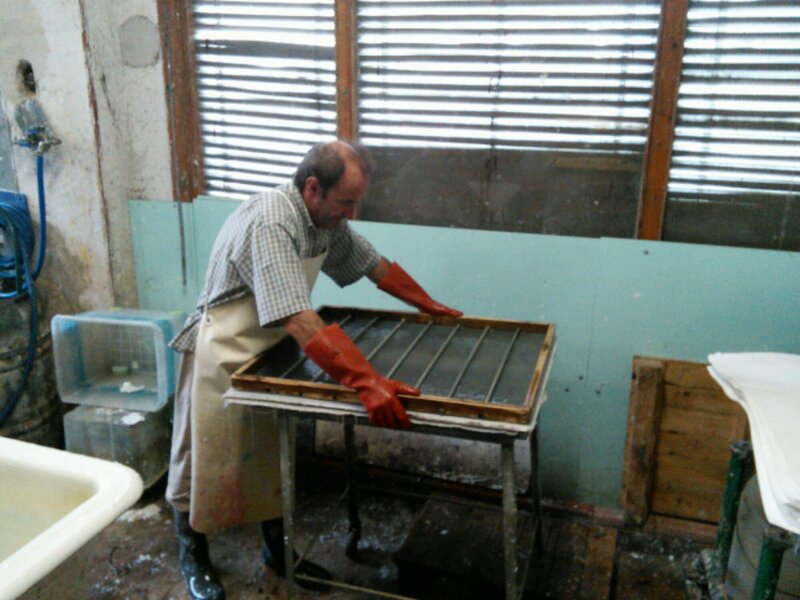 The post sits under pressure for a short spell, then Juan and Javier raise the press, slide the fresh post out onto a barrel, and peel apart the damp drying sheets with the fresh paper stuck to them from all the felts and interleaving sheets. 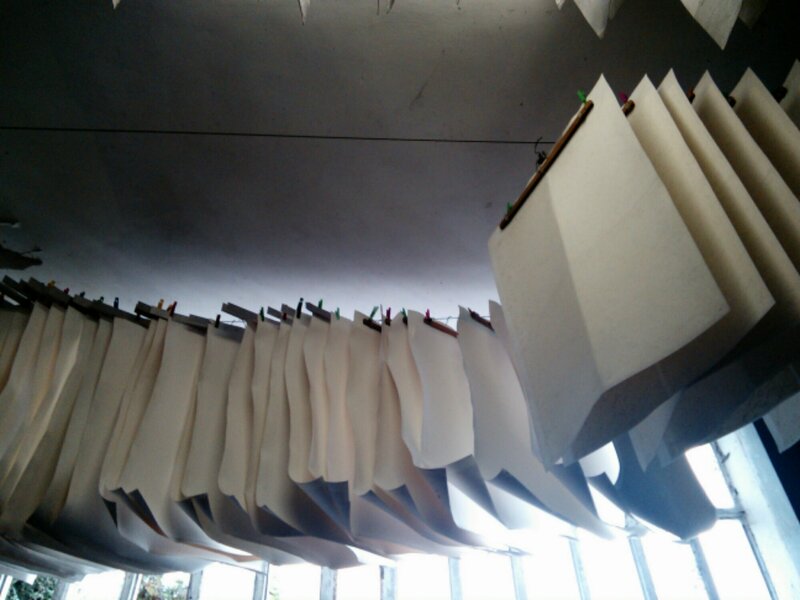 They move the fresh paper up to a mezzanine level where Javier hangs them to dry. 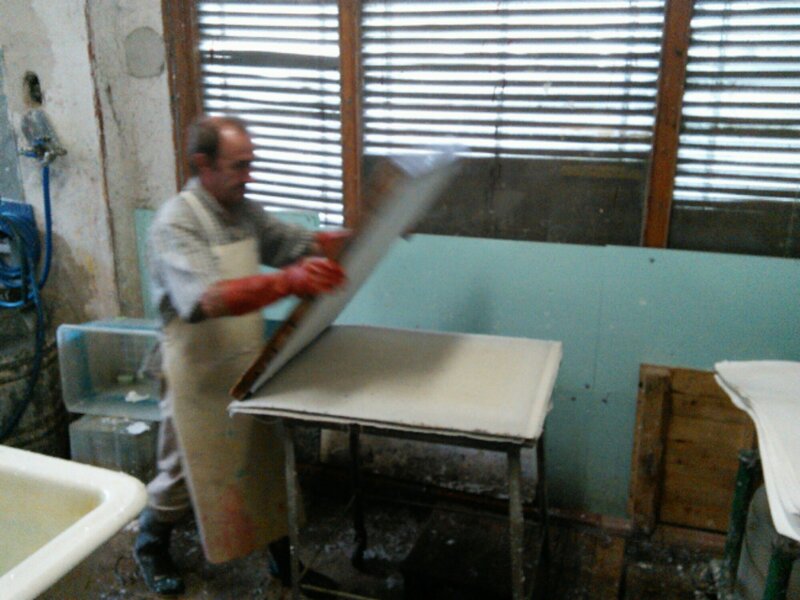 Then Juan moves all the felts and interleaving sheets back near the vat and starts another set. It’s noisy, wet, steady work that demands continuous concentration and patience. At the same time, it’s also meditative. Music and DJ chat on Radio 5 occasionally break through the buzz, hum and sloshing. Juan and Javier make very few mistakes, and I can tell by the tiny tweezers by the vat, used occasionally to extract a hair, that their standard is perfection. This entry was posted in art, Euskal Herria, paper making, Spain and tagged apprenticeship, art, paper, Spain on October 21, 2013 by Bill Horne.